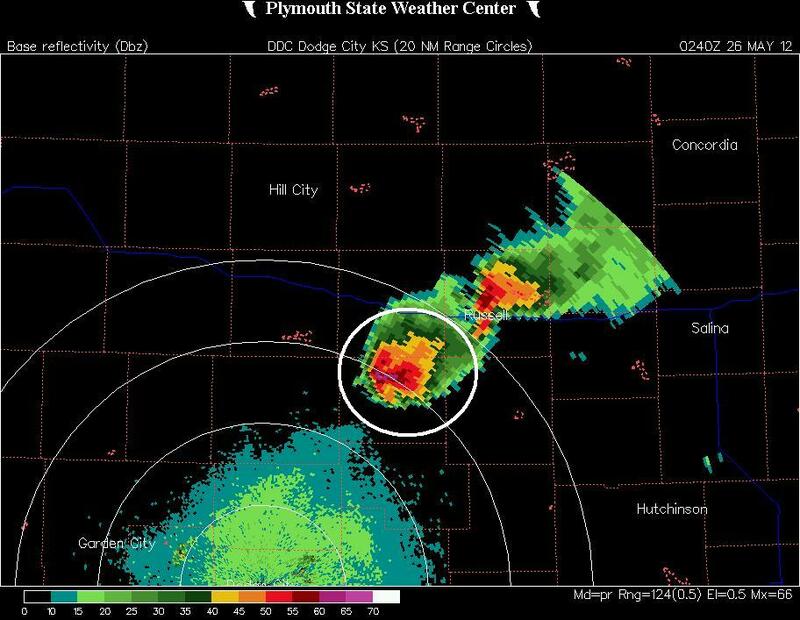 05-25-2012 CHASE LOG: KANSAS What an incredible day! Going into it, this day had potential to produce tornadic supercells but the one caveat was the cap and if storms would break through. There was an area of low pressure over the OK Panhandle with a warm front draped through central KS with a dryline extending southward through west-central KS and a triple point in the vicinity of Ness City, KS. 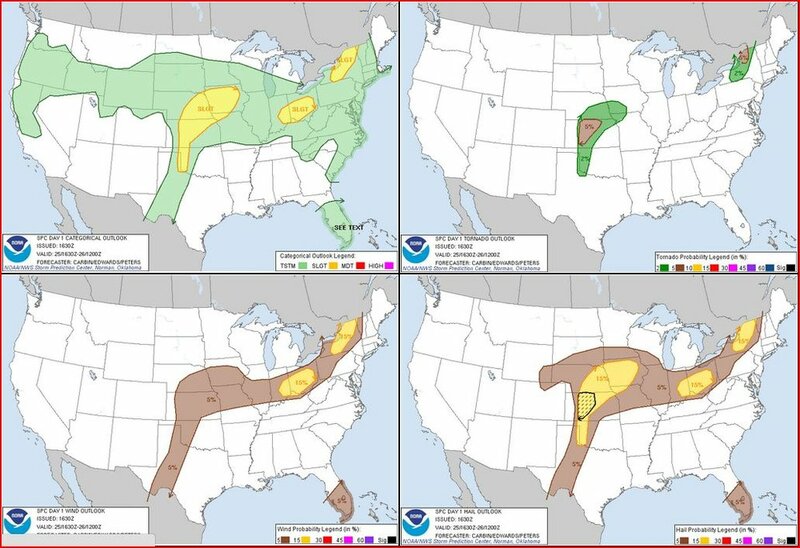 The warm front further east across northeast KS and northwest MO appeared to be the safer play, with a riskier chance for supercells along the dryline where the cap was stronger. We progressed south from Kearney, NE on Hwy 183 through Hays, KS and set up shop in a park in La Crosse, KS where the triple point was just to our west. 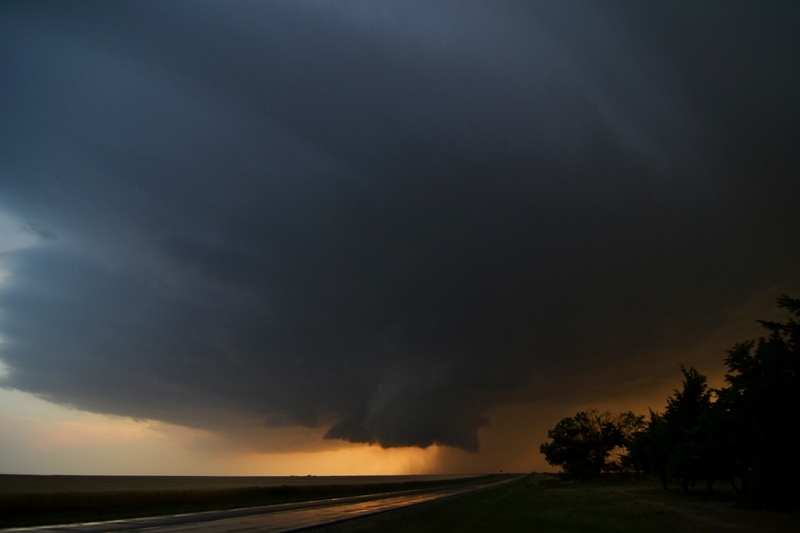 We favored the dryline over the warm front as most of the guidance was breaking the cap and any storms that did form in this environment would encounter extreme instability and high amounts of wind shear for rotating updrafts, supercells, and tornadoes. Moisture was a bit better further to the east, but only by a couple degrees as upper 60s dewpoints advected north along the dryline into this area. In the upper levels, about 40-50 kts of southwest 500 mb flow was in place as a trough was developing in the western U.S.
As we waited near the Barb Wire Museum in La Crosse, cumulus began building on the triple point, but kept getting tipped over, hit the cap, and died. A mesoscale discussion was issued at 3:57pm from SPC for our area, highlighting the risk for supercells with damaging winds and large hail as well as a tightly focused tornado threat. Finally one storm broke the cap and kaboom! Right away this storm had an amazing base and incredible structure with both forward and rear inflow bands into the storm as we blasted north towards Liebenthal to get ahead of the storm. 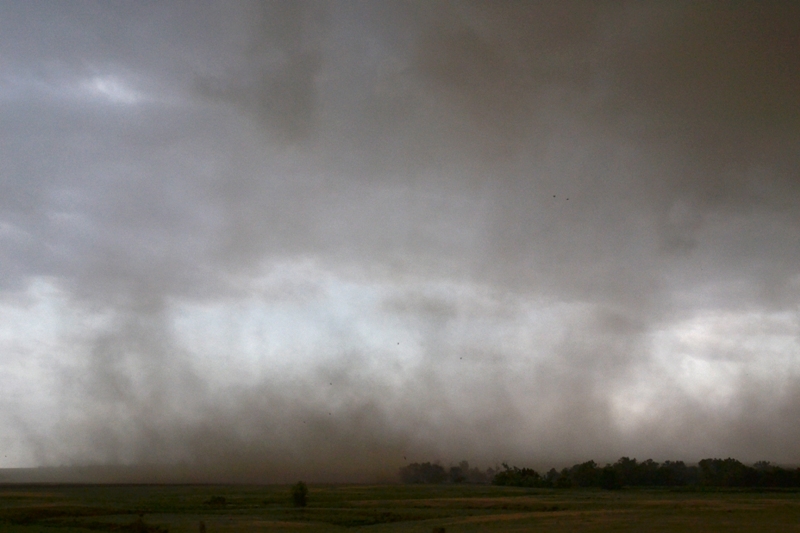 As we progressed east on a road near Victoria, KS and on the northern end of the storm, the RFD winds really started to kick in hard with a plume of dust and dirt being pulled completely around the lowered base of the storm and right back into the updraft. Shortly after, what looked like either a gustnado or tornado formed underneath the developing wall cloud and a tornado was reported from what you can see in the photos below. 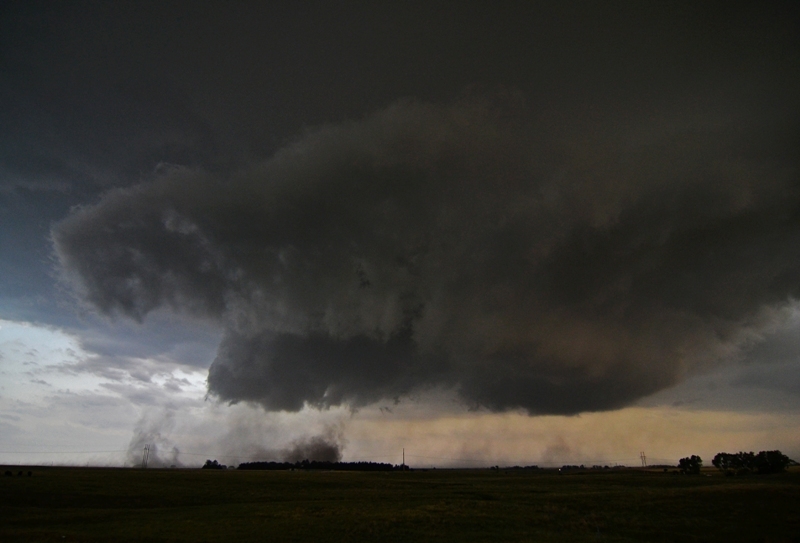 This was a bit questionable as it may have been a tightly focused gustnado, but there is a bit of a nub underneath the wall cloud and I guess you could call it a tornado since it was right underneath the area where you would expect one. If it was, it was weak as we ended up driving right through the dust/dirt plume from this RFD surge and “tornado”. We followed this storm to near Russell before giving up on it was it eventually died. Around this time, at 6:50pm, a tornado watch was issued for the area. Our attention then turned towards the tail end storm and we calculated that we could get there before dark by taking Hwy 281 south and Hwy 4 back to La Crosse to intercept. On the way, the middle storm produced a very well defined wall cloud and we actually did turn around after reaching La Crosse after hearing that this storm was producing. However, as we did so, our tail end storm west of La Crosse started to look better and we turned back around to head back towards our cell around sunset. Approaching the storm from the east, we could see the well defined inflow bands into it. Shortly after, about 5-6 miles west of La Crosse, this storm produced a rapidly rotating wall cloud and strong condensation and rising motion on the right edge. This storm took a while to do it (about 20 minutes with the wall cloud), but finally produced a slow moving cone tornado at 9:20pm that progressed across Hwy 4 west of La Crosse, became a large stovepipe and elephant trunk 1-2 miles northwest of the town, and eventually a tall rope tornado 2-3 miles northeast of town as the sirens blared the whole time and we got a close up view. It was tough to take pictures and video of this tornado due to the low light, but we managed due to the nearly constant lightning that was illuminating the tornado the entire time. The nice thing was that we were able to adjust camera settings and take our time since this tornado was on the ground for 54 minutes and only traveled around 10 mph! After the tornado roped out, we saw another tornado form to the northeast of La Crosse. We made the decision to head west behind the storm to get out of the way, but we could not go north due to downed powerlines and poles, so we continued to head west out of La Crosse, eventually back to our hotel much further north in North Platte, NE. 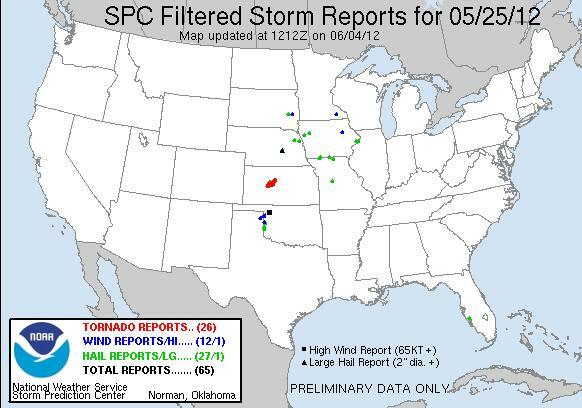 An interesting bit of news that we found out later was that a satellite tornado had formed to the south of the "main" tornado and caused some damage on the southern end of La Crosse. We were on the northern end of town so that would have put us right in between tornadoes at the time! Interesting start to the day, checking out the barbed wire tornado in the museum in La Crosse, KS. An omen of what we would see later in the day! Inflow scud foot becoming attached to the base as the storm started to become surface-based north of La Crosse, KS. 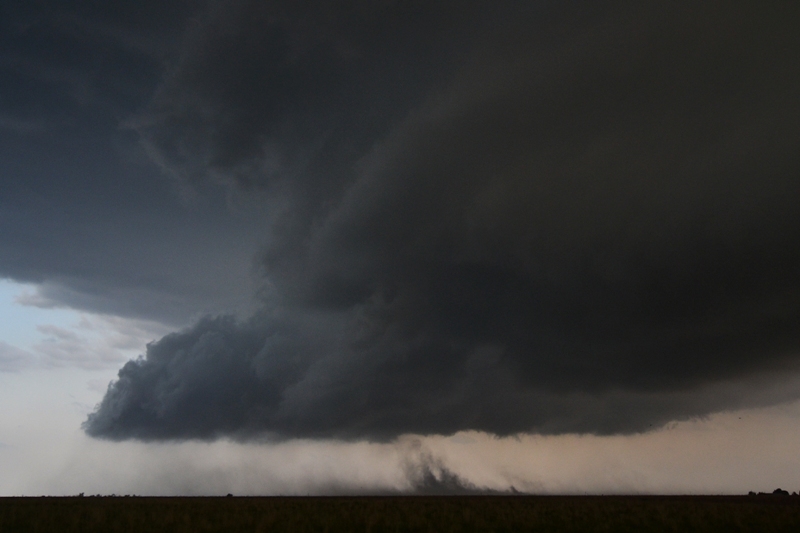 RFD surge starting to pick up dirt as the storm forms a wall cloud to the southeast of Hays, KS. We originally thought that this was a tight gustnado near Victoria, KS, but it was reported as a tornado and was officially listed as one. Insane RFD surge now picking up dirt and debris, lofting it well up into the air and back into the inflow of the storm southeast of Victoria, KS. Storm starting to take on that mothership look with huge rotating wall cloud and continued strong, dirty RFD push. Mammatus clouds near Otis, KS. Inflow stingers into the rotating wall cloud when we reached the storm west of La Crosse, KS at sunset. 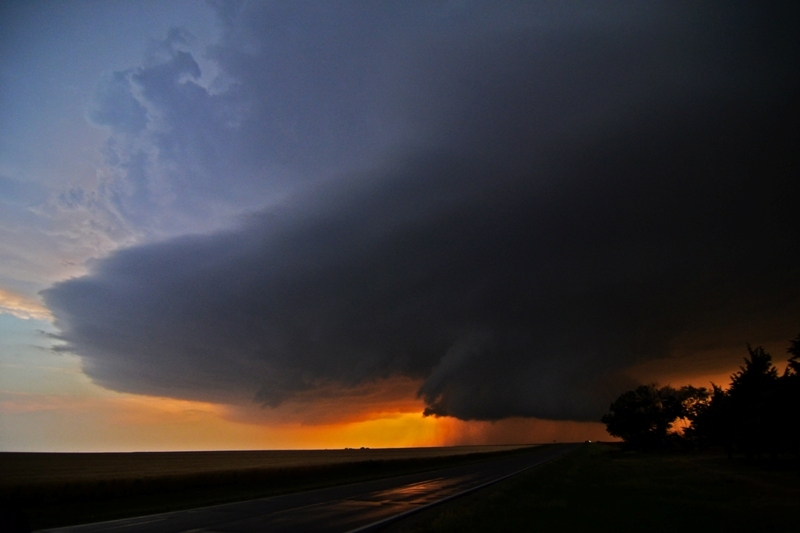 Another shot of the rapidly condensating wall cloud and rotating supercell at sunset. Tornado forming right after sunset 5-6 miles west of La Crosse, KS. 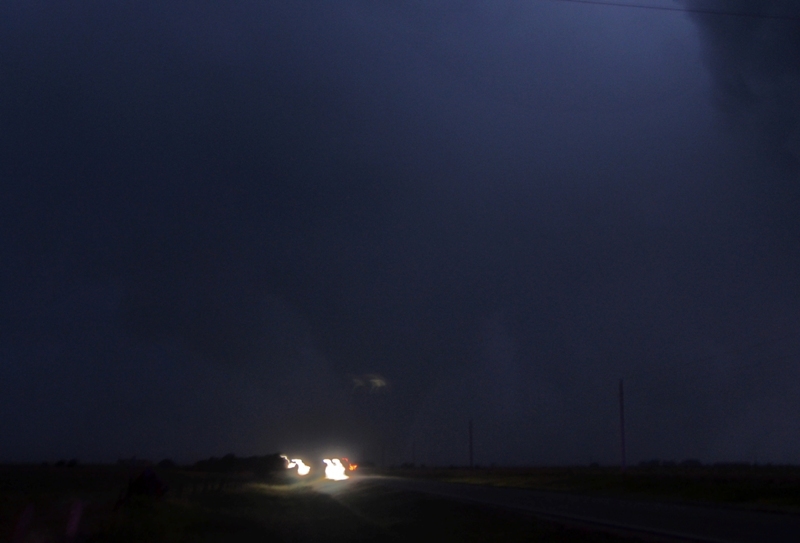 Tough to see, but you can make out the large cone tornado in there as it crossed Hwy 4 west of La Crosse, KS. 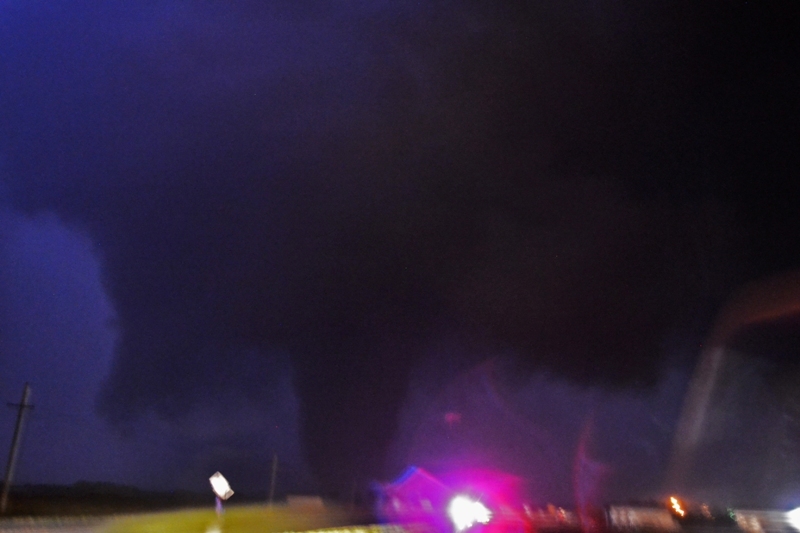 Blurry, but wanted to show the large tornado only 1-2 miles north of La Crosse as it was about to cross Hwy 183. Tornado almost became a wedge as the entire wall cloud was violently rotating at this point. Another blurry shot of the large tornado about to cross Hwy 183 to the north of La Crosse. Tornado quickly became a large stovepipe as it crossed Hwy 183. Entire wall cloud eroded. Tornado transitioning to a large elephant trunk as the cloud base continued to erode. Only 2 miles north of La Crosse. Another view of the elephant trunk north-northeast of town. Substantial debris fan at this point. 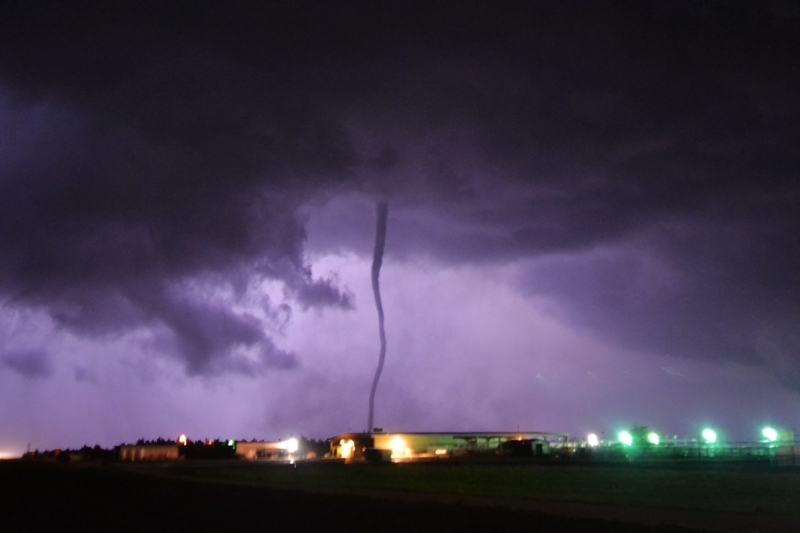 Tornado starting to transition into a roping out phase. Tornado starting to rope out, estimated at 3 miles north-northeast of La Crosse at this point. Tornado in full rope-out mode, dissipating a short while later. Radar reflectivity at 9:40pm with the La Crosse storm circled as it was producing a large tornado. Storm relative velocity at 9:40pm, showing the tight couplet associated with the tornado. Estimated at over 100 kts of shear from this image at the time as inbound and outbound winds are maxed out.